Available for purchase in digital and CD form, Rumblings of Revolution expresses our times — our questioning of the traditions that hurt us and others. It embodies the spirit that with inspiration, determination and support, even the humblest can rise. Moving us from our longings and pain to joy and forward momentum, the music is outside the box, combining vocals and instrumentals, as well as different styles and instrumentation from many different genres to make each song unique. In our very polarized times, this album helps bring us together in the way that only music can achieve. It’s beautiful, honest, raw and inspiring. Feel free to download any or all of these tracks. 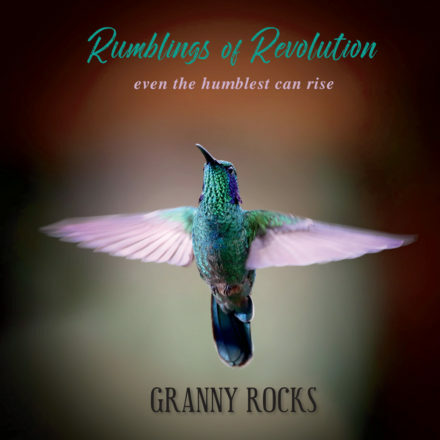 Rumblings is presented live through a Granny Rocks Experience, where Granny communicates with the audience, introducing each piece and delivering a message of real connection and the universality of our needs and potential. In addition, she personalizes every Granny Rocks Experience for each audience. A Granny Rocks experience can be offered in person or via the internet. Check out all details under Shows. To listen to the album or to purchase the CD or digital downloads, use the CD Baby link below! And please use the links below to share this music with others!